Why I have an English name? I grew up in Hong Kong (China), then a British colonial city. It is very common that Hong Kongers have a English name besides their traditional Chinese name because (A) It was trendy; and (B) we believe it has commercial advantages- we make it easy for the ruling foreigners who most of the time have difficulties (or majority I think simply do not care to learn) pronouncing our traditional Chinese name. NY Times summarize it so right: “The practice of taking an English name, which really took root only 15 or 20 years ago, began as a way of identifying with the ruling class, or being identified by it. Now, the English language name is not just a colonial convenience, it is a local Chinese custom.” Therefore, KENNETH is the English name my Dad gave to me at birth. 洪 (Hung) is my surname and 天健 (Tin-Kin) is my given name. 洪 is not a common surname, it ranks 99th in modern day China population. The last name 洪 is originated from my mythical ancestor 共工 Gong Gong– the Chinese water god who is responsible for the great floods, together with his associate, 相繇 Xiang Yao , who has nine heads and the body of a snake. In Chinese mythology, Gong Gong was ashamed that he lost the fight to claim the throne of Heaven and in a fit of rage he smashed his head against 不周山 now Pamir Mountains or Mount Everest, a pillar holding up the sky. The pillar suffered great damage and caused the sky to tilt towards the northwest and the earth to shift to the southeast. This caused great floods and suffering to the people. 女媧 Nüwa, an important and benevolent goddess, cut off the legs of a giant tortoise and used them to supplant the fallen pillar and alleviate the situation, but she was unable to fully correct the tilted sky. This explains the phenomenon that sun, moon, and stars move towards the northwest, and that rivers in China flow southeast into the Pacific Ocean. My Dad names me after a famous Chinese painter 贺天健. My given name 天健 comes from one of the oldest of the Chinese classic texts- 易經 / I Ching (Literally it means “Classic of Changes”) that dated back to the Zhou Dynasty (1122 BCE – 256 BCE). According to Wikipedia, the book is a symbol system used to identify order in random events. The text describes an ancient system of cosmology and philosophy that is intrinsic to ancient Chinese cultural beliefs. The cosmology centres on the ideas of the dynamic balance of opposites, the evolution of events as a process, and acceptance of the inevitability of change. 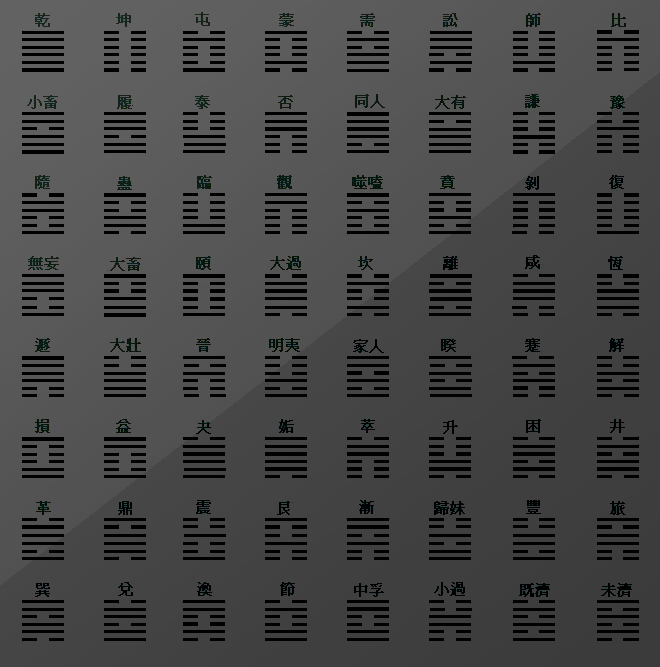 The text of the I Ching is a set of oracular statements represented by a set of 64 abstract line arrangements called hexagrams (卦 guà). Each hexagram is a figure composed of six stacked horizontal lines (爻 yáo), where each line is either Yang (an unbroken, or solid line), or Yin (broken, an open line with a gap in the center). With six such lines stacked from bottom to top there are 26 or 64 possible combinations, and thus 64 hexagrams represented. My name comes from Hexagram 1 (see left image), named 乾 (qián), “Force”. Other variations include “the creative”, “strong action”, “the key”, and “god”. 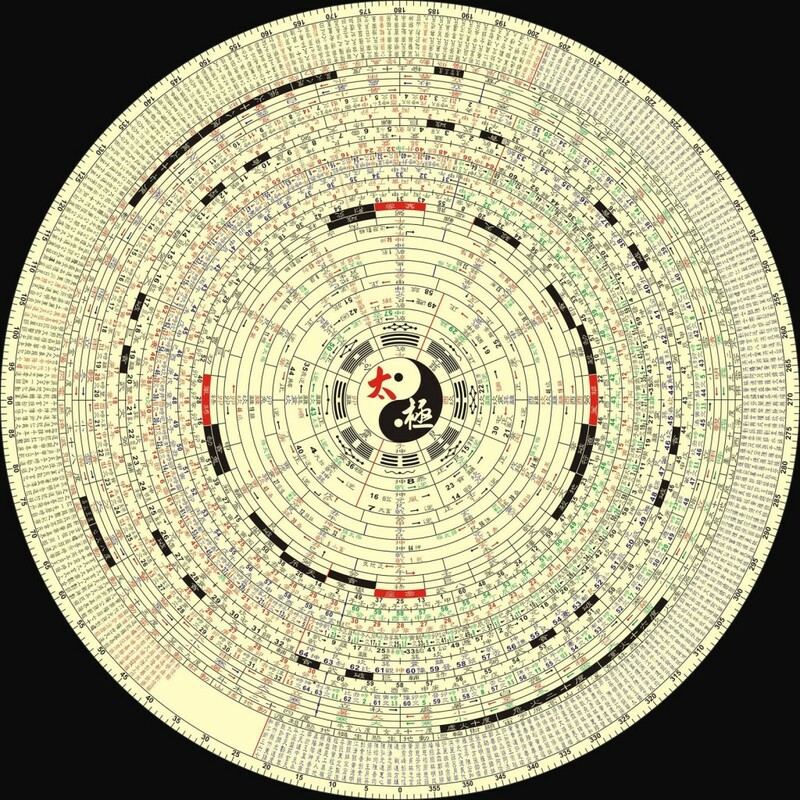 Its inner (lower) trigram is ☰ (乾 qián) force = (天) heaven, and its outer (upper) trigram is the same.